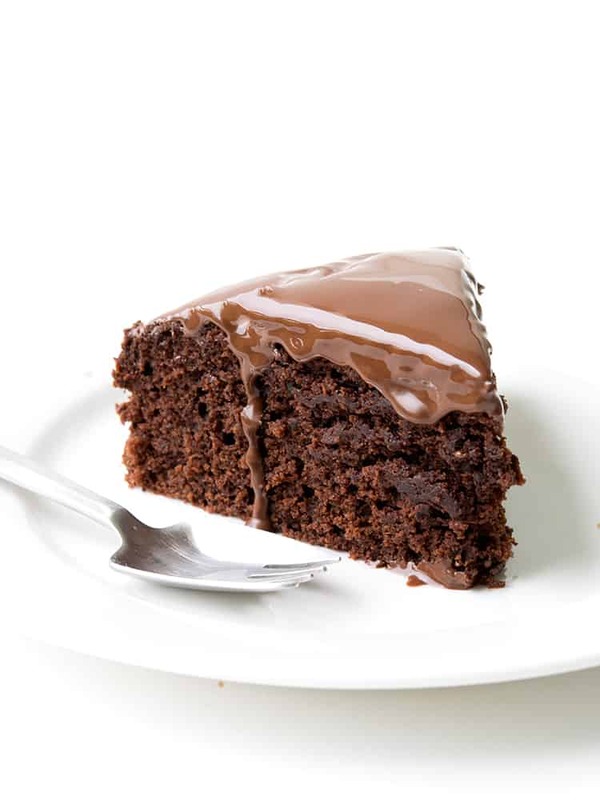 This easy Dairy Free Chocolate Cake is perfectly fudgy and moist. 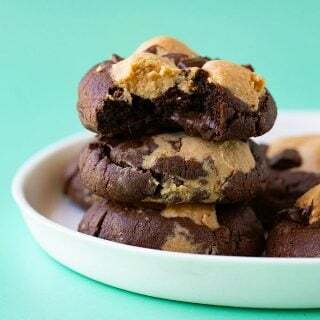 Made with dairy free chocolate, olive oil and almond milk, it is a simple mix and stir recipe – no electric mixer required. Finally! 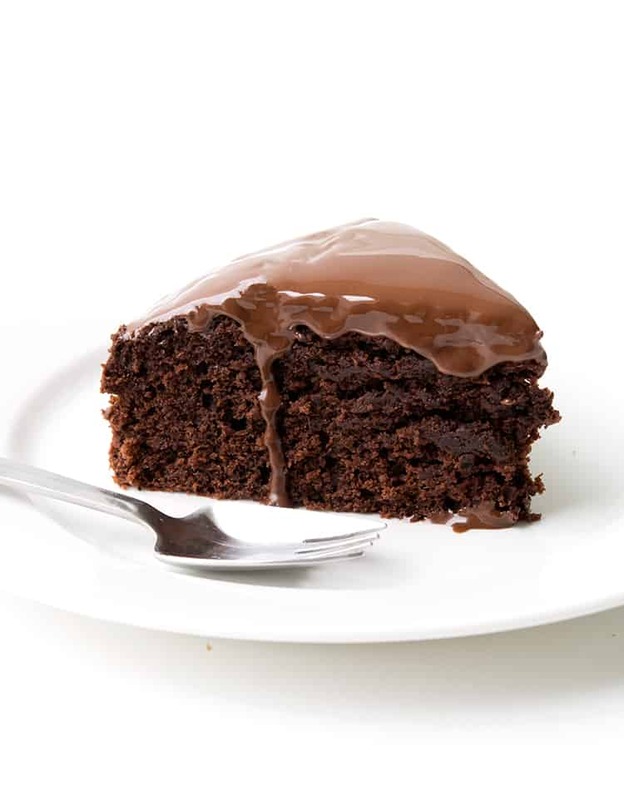 A deliciously rich chocolate cake that’s completely dairy free. That’s right! No butter, no milk, NO PROBLEM. I’m so excited to be teaming up with Almond Breeze to bring you some amazing new recipes! Starting with this gorgeous chocolate cake. Honestly, I could not stop eating this cake. My favourite part? That gooey olive oil ganache. It makes me swoon just looking at it! It starts out silky smooth, but give it a few minutes and it goes a little firmer, with the perfect melt-in-your-mouth texture. Who knew chocolate + olive oil = heaven! It makes for a wonderful dairy free frosting. Since I recently shared my Flourless Chocolate Cake recipe with you, I’ve been inspired to push the limits on chocolate cake. 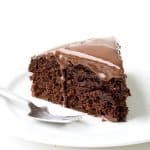 So a delicious choccy cake can be made without flour, but is it possible to create one without dairy? OH YES IT IS. Honestly I think this cake rivals ANY cake with butter. It has a beautiful crumb and a seriously moist centre. And it pairs perfectly with the dark chocolate ganache. And the best part of this cake? It’s one bowl. All you need is a bowl and a spoon and this cake is ready to go in the oven. I don’t know about you but I get seriously excited about recipes that are easy AND tasty. And this is most definitely one of them! I made this cake again this week for a group of friends and no one even guessed it was dairy free! So what are you waiting for? It’s time to get baking! Don’t forget to snap a pic of your Chocolate Cake and tag @sweetestmenu on Instagram. 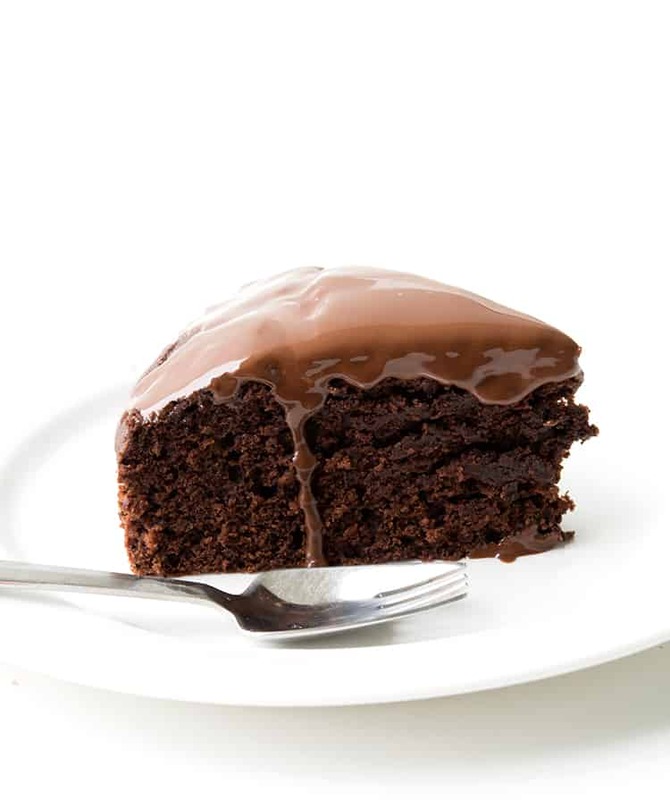 A deliciously easy, one bowl chocolate cake that’s dairy free! Preheat oven to 170 C (340 F). Grease and line an 8 inch cake tin with baking paper. In a large mixing bowl, sift the flour, cocoa powder and baking powder. Add the sugars and stir to combine. Make a well in the middle of the dry ingredients. Add the eggs, almond milk, olive oil and vanilla and gently fold. Pour in the hot water and stir until a smooth chocolate batter forms. Bake in the oven for approximately 30 minutes or until a skewer inserted in the middle comes out clean. Transfer to a wire rack to cool completely. 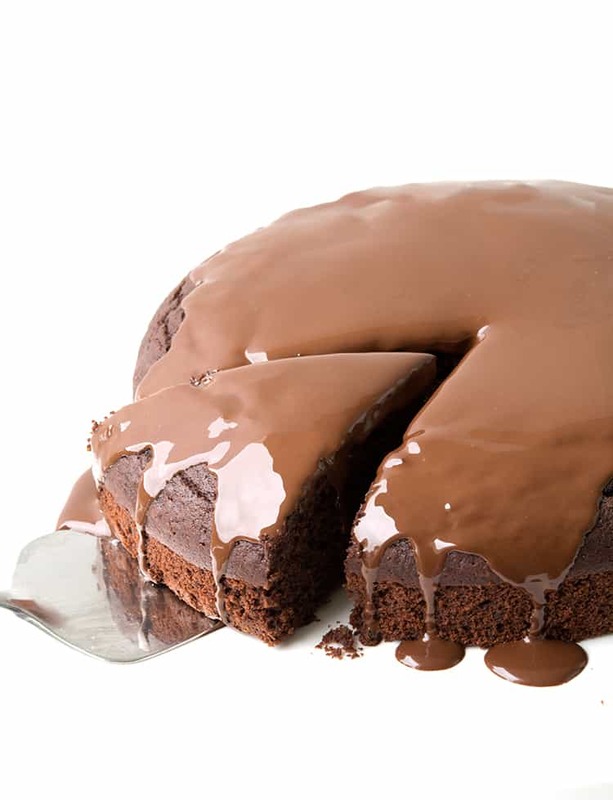 To make the ganache, add the chocolate and olive oil to a small bowl. Heat in the microwave, stirring every 20 seconds, until melted. Leave to stand for 15 minutes. 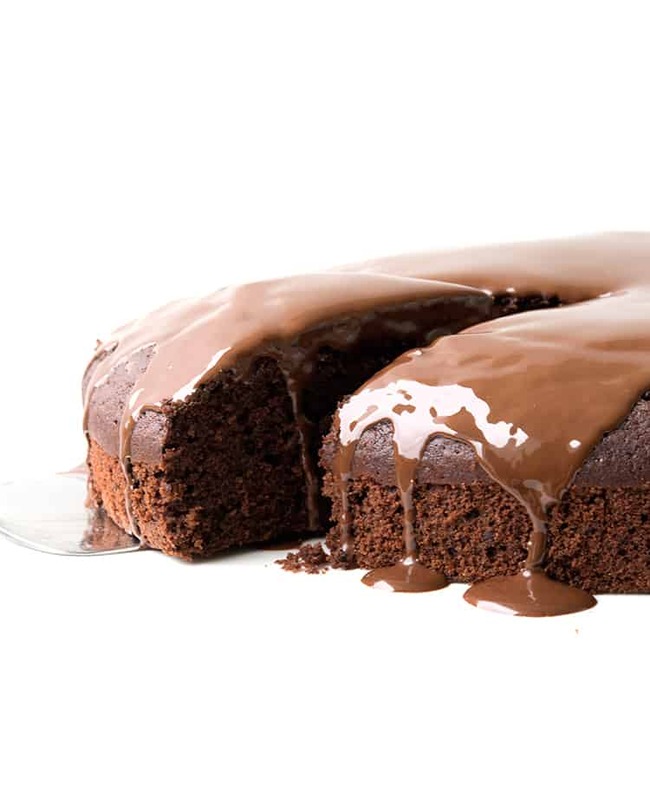 Pour ganache all over cake. 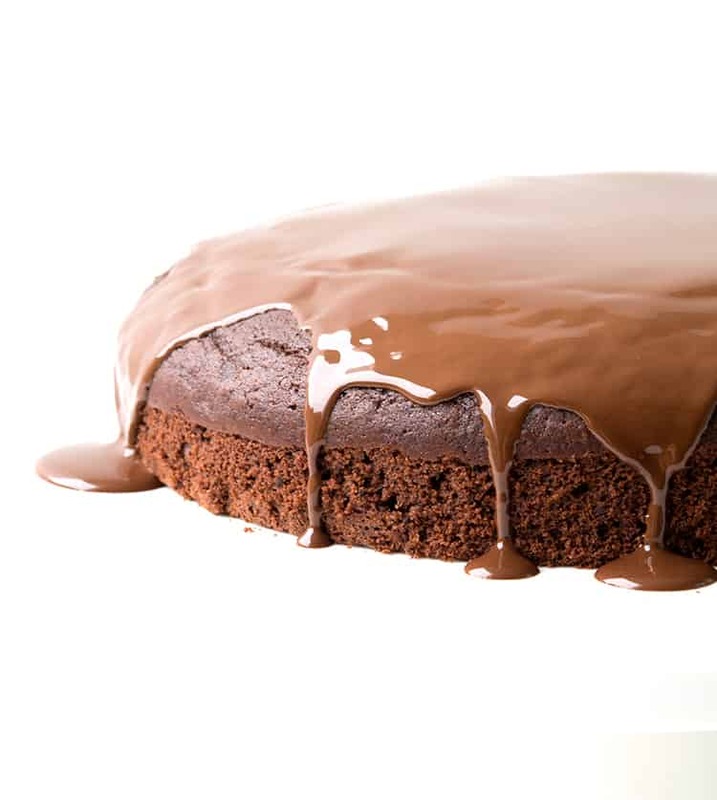 *Use a mild tasting olive oil so it doesn’t overwhelm the chocolate flavour. Hello. Does this recipe call for sweetened or unsweetened almond milk? Hello! I have a dairy allergic friend and I wish to bake this cake for his birthday. I’ve never purchased dairy free dark chocolate before – is it in a powder form or is it like a chocolate bar I need to cut up prior to adding it with the olive oil ? Thanks ! Hi! Thanks for asking. Here in Australia, we have dairy free dark chocolate in blocks like regular chocolate. It usually says on the packet if it’s dairy free. And yes, just roughly chop and melt together with the olive oil. I hope that helps! Thank you for this recipe. My son is allergic to dairy, soy, corn, and coconut (oddly enough). Most recipes that are dairy free either have a bunch of gluten free ingredients I don’t want to use or they have lots of coconut milk/oil in them. This is great and the ingredients are straightforward and simple which I appreciate. Aww I’m so happy to hear that Cat! 🙌🏻 And I’m so happy your son was able to enjoy this cake!! Can I use coconut milk instead of almond milk? Hi Caroline, I haven’t tested this cake with coconut milk so I’m not sure – sorry! I made this for my little boy’s first birthday with coconut milk and it was delicious! Hi, Could I use Norco Lactose Free milk instead of Almond milk? Aww thanks for the lovely feedback Shirley! Do I use unsweetened cocoa powder??? Can I put the ganache on today for a cake to eat tomorrow or should I put it on tomorrow. It’s a birthday cake for my sister. Hi Nicky! It’s really up to you! If you do it today, the ganache will have time to set and will be a little firm but still delicious. However, if you want it drippy like the picture, I’d make it and pour it over right before serving. I hope you love it! Hi Nicky, it’s not your fault. Olive oil ganache tends to set harder than regular ganache but it should still taste delicious! Have substituted olive oli with coconut oil. Can you substitute the olive oil with coconut oil? This cake recipe was amazing! I substituted the eggs for flax seed and the sugar for coconut sugar and only a small amount of brown sugar. Also used buckwheat flour instead of plain. Wow! Thanks Emma. So glad you enjoyed it! Can I use self raising flour for some height? Hi Jess, I wouldn’t recommend changing the type of flour in this recipe, as it has been tested with plain flour. Although it may not have much height, I can assure you that’s what makes it have a lovely fudgy texture. This was so nice, can’t believe it’s dairy free! So glad you enjoyed it Josh! 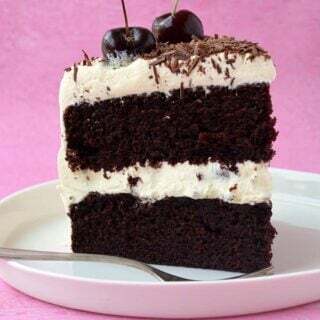 What a lovely chocolate cake! It looks beyond decadent and that drizzle is to die for! Oh amazing, I hope you love it Ashley! 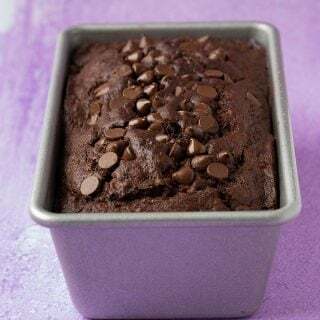 You’ll never guess it’s dairy free, it’s so fudgy!